Effortlessly collect, show and manage customer reviews with the one and only Trustbadge® technology for your osCommerce store! Once integrated, it updates automatically. If you don't have an account yet, it's free and easy to sign up. Before you edit the file, please create an appropriate backup to be able to undo the changes afterwards. Now save your changes and transfer it to the server. 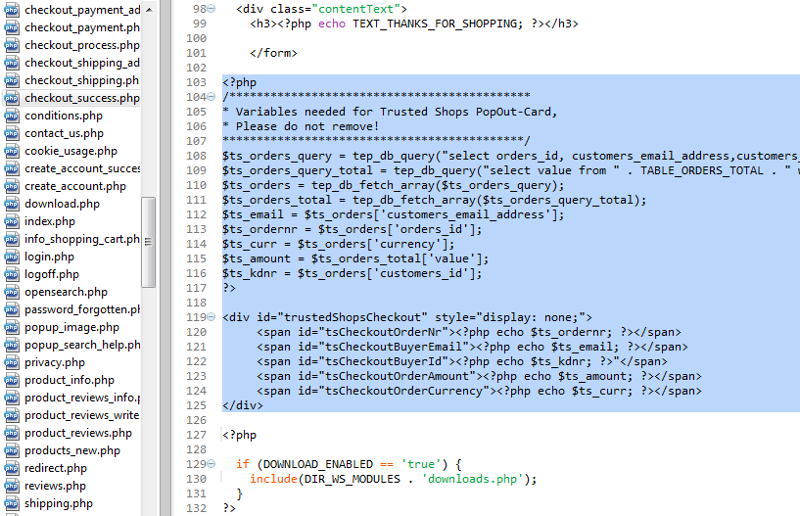 Enter your unique Trusted Shops ID into the relevant box and your personal integration code will be generated. Now copy the generated code into your clipboard. Again from the filesystem of your osCommerce installation open the file/osCommerceInstallation/catalog/includes/template_bottom.php. Scroll down to the very bottom of the file, searching for the phrase </body>. Enter the copied code from Step 2 in the line right above this phrase and again save your changes and transfer it to your server. You have successfully integrated the Trustbadge®, congratulations! The good news is that your Trustbadge® is already requesting reviews automatically. To invite previous clients to leave a review, start using the Review Collector now!